A man who goes by the name of Zhang Jian has been grabbing regional headlines over the past week. More famously known as the self-proclaimed “future richest man in the world”, Zhang was arrested on Tuesday (June 6) by Indonesian police in Batam city island. Zhang, whose real name is Song Miqiu, is believed to be the mastermind behind several get-rich-quick schemes in China, Malaysia, Thailand and Indonesia. The www.ysmwxb.com website of Wu Xin Bi – Zhang’s latest “coin” venture – is now inaccessible and over 5,000 Malaysians with RM17.5mil invested are now left in the lurch, reported Oriental Daily. Sin Chew Daily reported that according to mainland Chinese media, Chinese police tracked Zhang down with help from their Indonesian counterparts and the Chinese Embassy in the country. Chinese police investigations revealed that Zhang had set up a trading company called Yun Shu Mao with other partners in November 2012 as a front for illegal multi-level marketing schemes, involving up to 600mil yuan (RM376.63mil). Police in China’s Hunan province began investigating Zhang and his partners in December 2013, reported Sin Chew. Zhang immediately fled the country but continued his illegal activities in South-East Asia. He made headlines in the Malaysian media in 2014 when billboards of him appeared in Penang, proclaiming him to be the “future richest man in the world”. He also awarded his lucky “distributors” with luxury cars. The country’s Domestic Trade, Cooperatives and Consumerism Ministry then launched an investigation into Zhang’s company but he fled to Thailand. On Oct 27, 2014, Thai police arrested Zhang, his wife Yoyo Wang Wen Fang, 29, and his right-hand man Geng Lian Bao over a pyramid scheme and seized assets worth 240mil baht (RM30mil). After Zhang’s release in 2016, some supporters claimed that he remained in Thailand but his actual whereabouts then were a mystery. Chinese police sent their officials to track him down several times and even issued an Interpol red alert on Zhang in March 2016. They also sought cooperation from police in Thailand, Malaysia and Indonesia to investigate Zhang’s activities. Recently, Zhang was seen making a comeback in Malaysia to promote Wu Xin Bi, a coin which he claimed had investment value on the Internet. Through this scam, he duped at least 190,000 people from 28 provinces in China, according to Chinese authorities. 33 people involved in the scheme were subsequently detained. It was also found that the Yun Shu Mao website operator had corerced fees from followers who were promised huge rewards in return. Zhang and his wife, Yoyo Wang Wen Fang, as well as his accomplice Geng Lian Bao were arrested by Thai police at a condominium in October 2014 over a pyramid scheme. The pyramid scheme reportedly duped people in China and Malaysia out of 6 billion baht (S$243 million) and 3 billion baht respectively. 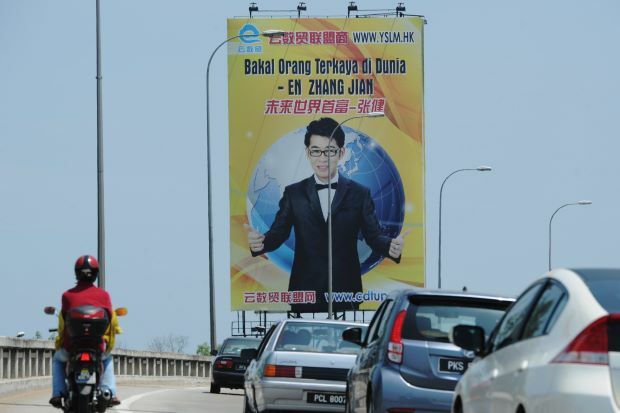 In July 2014, Zhang made headlines in the Malaysian media when billboards of him appeared in Penang, promoting his get-rich-quick scheme. Thai police had also seized assets worth over 240 million baht. His actual whereabouts remained a mystery after his release in 2016. But by March that year, Chinese police had issued an Interpol red alert on him. In April, he had allegedly also organised similar charity dinners in Johor Baru, Kuala Lumpur as well as in Sabah, The Star added. Zhang wasn’t seen at the dinner and company members claimed that he was in the Maldives. Again we can only salute the Indonesian police force for their good work, who are able to identify and capture him without being bribed as notoriously they are known for. Many times people attracted to golden dreams without a clear logic, and Zhang, unfortunately, sees the windows to a bickering heart of man full of greed.